Hello, I am Lauren at the Movement and Wellbeing Clinic. 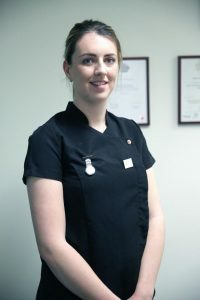 I have worked as a massage therapist for many clients, including high level sporting clubs in Basketball, Rugby, Gaelic Football and Lacrosse. I really enjoyed the experiences and I do believe it had a major impact on my level of care and ability at present. As I am qualified in sports science at degree level and a student physiotherapist, my level of anatomy and treatment choice is higher than the standards set by the Sports Massage Association. Because of this we can guarantee you a level of care that is unrivalled in the community. Working alongside Ed (Osteopathy) and Catherine (Mindfulness) allows us at the clinic to give you the best treatment choice, because your health is paramount. So Why choose Massage Therapy? Here at the Movement and Wellbeing Clinic, massage therapy is used as a treatment of choice for numerous conditions such as musculoskeletal injuries, cancer, stress, relaxation, and pregnancy. It has many benefits that is deep rooted in medicine across the ages. The holistic nature of massage therapy means it has multiple benefits that lie under the surface. Massage Therapy has been found to lower anxiety levels, improve mood scores, and significantly lower Cortisol levels. Along with helping you respond to stress, Cortisol plays a key role in other functions, including how your body breaks down carbohydrates, lipids, and proteins. Increased Cortisol levels are strongly linked with ageing, increased blood pressure and blood sugar levels, hardens arteries, increases fat storage and lowers growth hormone. Cortisol appears to play a key role in osteoporosis, muscle and collagen loss, and it believed to weaken the immune system. Massage Therapy has been found to improve quality of life, reduce perceived stress and pain and improve muscle flexibility. Pain has a considerable impact on psychological, social, economic and biological well-being of the patient. Massage Therapy is one of the most widely used techniques, with positive results such as pain reduction and muscle tension. Massage has been found to reduce the production of inflammatory cytokines (proteins) in muscle, reducing local inflammation, which could reduce the muscle pain in Fibromyalgia. Other studies demonstrated that massage influences some parts of the brain, related with stress and emotion regulation. The overall benefits are largely supported by research with the main effects being increased lymphatic flow thus aiding removal of waste products, promotion of muscle relaxation and healing, improved joint range of movement, and reduction and/or relief in pain. Should I use massage therapy if I’m not in pain? Yes. The other huge benefit to massage therapy is using it as a preventative strategy. The holistic advantages to using massage as a lifestyle treatment includes everything mentioned above, and usually the client finds themselves enjoying the experience on many levels not just physically. They say it’s better the be PROactive than REactive. It is very common for recreational athletes to ignore small symptoms or tight muscles during the run up to an event for the tightness to turn into an injury which at worst rules them out and at best reduces their capacity to compete. So if you’re competing in a marathon, playing football or basketball on a regular basis or just believe there are tense knots present, look no further than myself at Movement and Wellbeing Clinic.